Who is Eye Can Sew & Embroider, too? 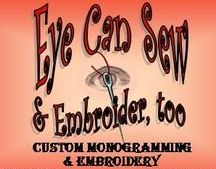 Eye Can Sew & Embroider, too is a custom monogram and embroidery company capable of embroidering just about anything from athletic shoe tongues, casserole carriers, clothing, jackets, coats, polo shirt logos, purses, shower curtains, towels, totes, umbrellas. wedding items and more. If you have a project that you've had in mind for some time, but never get around to starting, consult with Eye Can Sew & Embroider to help make your project a reality. Eye Can Sew & Embroider has a background in textiles and clothing, fashion merchandising, sales of embroidery and sewing machines, educational machine and technique instruction and custom monogramming plus posses exceptional customer service skills. Eye's grandfather was a master upolsterer trained in Switzerland who operated a successful furniture reupolstery/restoration business from a shop in his garage. He taught Eye's father all about the business, leading him to start an antique and classic automobile restoration/reupolstering business. Eye has inherited those creative sewing genes with her primary interest being in custom monogramming, embroidery and sewing projects.